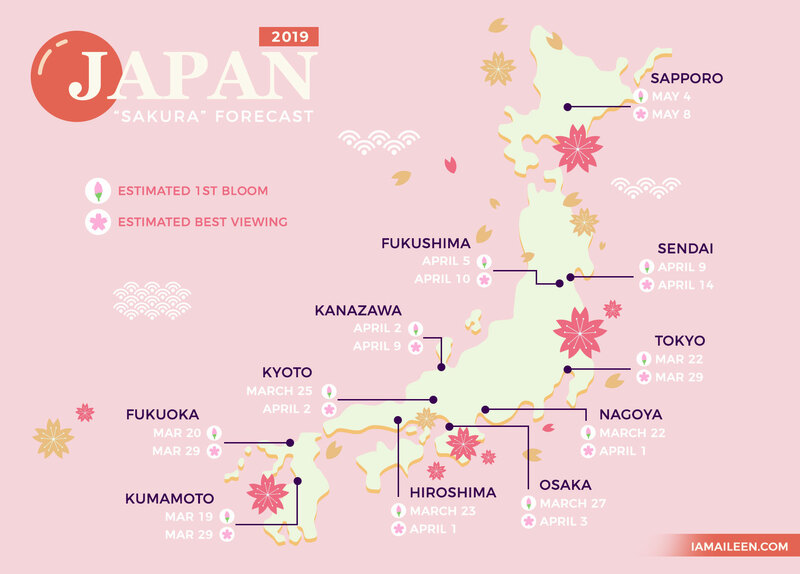 It’s NO exaggeration when I say that every Japanese and (almost) every keen traveler in the world keeps a close watch on the cherry blossom(sakura) forecast of Japan at the start of every year! After all, who wouldn’t want to catch the short-lived yet magical spring season wherein every space in the country is enveloped in shades of soft pink and white? …And as such, this is where this post comes in! Cherry blossom trees in Japan bloom in an upward direction starting from the island of Okinawa (sometime in the middle of January) and then ending at Hokkaido (around the end of April or beginning of May). If you think about it… provided that you’ve got the time and the money, you can totally indulge in a 3-month long travel spree to enjoy the whole pink season! But of course — not everyone can do such a thing, so if you only have a limited vacation time for Japan, below is a list of some of the best and most popular spots for viewing the cherry blossom season. Chidorigafuchi: This is one of Tokyo’s most magical sights given the cherry blossoms that surround the moat in the former Edo Castle around Kitanomaru park. There are even boats available for rent to better enjoy the trees up close! At night, the trees are lit up and several food stands are found nearby. Sumida Park: This is a great recreation space given that the trees are lined up on the sides of the river with views of the Tokyo Sky Tree in the distance. Like Chidorigafuchi, there are boats you can rent as well as surrounding food stalls. The trees are also lit up at night. Shinjuku Gyoen: A spacious park that has over more than a thousand of cherry blossoms in different varieties! Everyone is free to put up a picnic here for doing ‘hanami‘ but take note that alcohol is prohibited. Ueno Park: This is Tokyo’s most crowded spot for cherry blossoms — this is not only because of the thousands of trees lining the street but also because of how the trees here often bloom 1 to 3 days ahead of the others in the city. Meguro River: For hundreds of meters, there are about 800 cherry blossom trees lining this river. It’s not a good place for doing a picnic but it’s a good place for taking photos, for sure! Yoyogi Park: Located near the shopping district of Harajuku, this park has over 600 cherry blossom trees in its vicinity. TIP: Discover the beauty of Mt. Fuji up close as well as its nearby natural attractions by going on a day tour from Tokyo! Or if you come sometime around April 14 to May 27, you can take part in the limited-time Shibazakura Festival near Mt. Fuji where you can witness a field of unique pink moss!. Sankeien Garden: This is a Japanese landscape garden that has a central pond and several historical buildings (thereby giving off a great traditional look). Mitsuike Koen (Park): Featuring 3 ponds, this park has been listed as one of Japan’s “100 best cherry blossom spots” so it’s definitely worth visiting. Tsurugaoka Hachimangu Shrine: You can get some great shots of this shrine with the nearby cherry trees that are numbering by hundreds. Akagi Senbonzakura: It has a unique “pink-on-pink” feature given the surrounding ‘pink moss’ in the fields that are found just beside the cherry blossom trees. Tetsugaku No Michi: Dubbed as the “Philosopher’s Path”, this runs beside a canal connecting Ginkakuji to Nanzenji and it is lined by hundreds of sakura trees. Maruyama Park: Found beside Yasaka Shrine is this popular public park that has a large weeping cherry blossom tree (yaebeni shidare) in its center. Make sure to catch it at night when it’s lit up! While you’re there, you can enjoy the nearby food stalls too. Heian Shrine: Yet another place to find weeping cherry trees — but in more numbers. Take note that these weeping trees reach full bloom just after a few days that the other normal cherry trees do. Arashiyama: Located in the western outskirts of Kyoto, this place is not only known for its Bamboo Groves and Monkey Park (Iwatayama) but also known for its great areas for cherry blossom viewing. An ideal spot would definitely be by the Togetsukyo Bridge on the riverside of Nakanoshima Park. TIP: Ride the charming Sagano Scenic Railway that goes along Arashiyama to Kameoka. It’s a great way to soak in the cherry blossom views around you given the train’s clear glass ceiling..
Kema Sakuranomiya Park: This park seemingly has endless rows of sakura trees — besides, they number at nearly 5,000! You can enjoy such a grand view either from the riverside promenade or from the ships going through the river. Osaka Castle: Naturally, a stop here is warranted due to the 4,000 sakura trees that surround it. And if I may share a tip, the Nishinomarupark on the western side of the castle is great for doing picnics as it gives great scenic views of the tower. Expo 70 Commemorative Park: Yet again, another area with thousands of cherry blossom trees. At night you can enjoy it even more when they light everything up. TIP: From Osaka, you can also do a day tour with KKday to Kyoto’s Arashiyama and Nara’s deer park to enjoy the sakura season!. Yoshinoyama (Mount Yoshino): Wanna know Japan’s #1 cherry blossom viewing spot for centuries? Then, head over here! You’ll surely be overwhelmed by the 30,000~ cherry trees that surround this mountain. Nara Park: Outnumbering the free-roaming deers are the 1,700 cherry blossom trees that are planted here! Make sure to go southeast of Todaiji’s main hall if you want a huge lawn encircled by these pink trees. Wakakusayama: Found just behind Nara Park, this hill’s hiking trail is lined with cherry blossoms, and if you go a bit to the top, you’ll get a good picture of everything with the dense city as a backdrop. Fuji Five Lakes: If you head over to the northern shore of Lake Kawaguchiko, you’ll get a magnificent sight of Mount Fuji with the surrounding cherry blossoms on the lake. TIP: You must visit in the early mornings for the best visibility and light. Chureito Pagoda: This pagoda attracts a LOT of people every year especially during spring season because it really is a perfect spot for captruing Mt. Fuji and the surrounding terrain (as you can see from the photo above!). TIP: You can easily go to these 2 places by going on a day tour from Tokyo! Or if you come sometime around April 14 to May 27, you can take part in the limited-time Shibazakura Festival near Mt. Fuji where you can witness a field of unique pink moss..
Matsumoto Castle: What better way to capture and see one of Japan’s most beautiful original castles than to see it during sakura season, right? With the hundreds of trees planted there, there’s enough to color the grounds. Takato Castle Ruins Park: It is included in the top 3 best locations for seeing sakura blossoms in Japan (along with Hirosaki Castle and Yoshinoyama)! Plus, for the whole month of April, a festival is held here where many stalls are set up and illuminations are also always held every night from sunset to 10:00PM. Kenrokuen: This has been called as one of Japan’s “3 most beautiful landscape gardens”, so it comes as no surprise that this has become a great cherry blossom viewing spot. Yamazakigawa Riverside: The Shikinomichi (“Path of Four Seasons”) beside this river is regarded as one of Japan’s “100 best cherry tree blossom spots”— and rightly so! Don’t forget to stop here when you’re in Nagoya. Nagoya Castle: Surely, you wouldn’t miss this castle when you’re in the city! During spring, there are several weeping cherry blossom trees, rare sakura tree varieties and somei yoshino around the castle and along the moats. TIP: From Nagoya, you can go on a day trip to the famous World Heritage Site of Shirakawa-go to enjoy its picturesque traditional houses that are amidst pink cherry trees..
Miyajima: This is the small island found outside of Hiroshima that is famous for its “floating” torii gate. As you would expect, this makes for a great sight in the spring! To start off the fun, there are 1,300 sakura along the walking trails leading to the torii gate. Hiroshima Peace Park: There are approximately 300 cherry trees around this park where the popular Peace Memorial Musuem is also found (the latter commemmorates those who died during the atomic bombing and it also serves as a testament to world peace). Matsuyama Castle: This is one of Japan’s 12 “original castles” and I guarantee you that the views from the castle tower during spring is beyond remarkable! Megijima Island: This is the island in Takamatsu that’s associated to ‘Ogre Island’ from the popular Momotaro legend and if you go to the mountain-top park of the island’s tallest peak, you’ll have incredible views of the cherry blossom trees and the sea. Nishi Park: This is another one of those places that has been included in Japan’s “100 best cherrry blossom spots”. As a hillside park, you’ll revel in the thousands of sakura trees as you enjoy a picnic in its green spaces. This is also the site of the Terumo Shrine which is the family shrine of Fukuoka’s former feudal lords. Kumamoto Castle: As one of Japan’s most impressive castles, it certainly has become one of the city’s most popular hanami spot. All over the terrain, there is a striking envelope of pink hues from the cherry trees. Hanamiyama Park: Just outside central Fukushima is this park that’s nestled on the slopes, and the amazing thing about this park is that you’ll be rewarded by a plethora of cherry blossom trees in varying hues of pink! Make sure that you grab a map from the information booth since it shows the best walking trails and picture-taking spots. Shinobuyama Park: If you want to bask yourself with more cherry tree views, head to this public park on the northern part of the city. Apart from doing hanami, you can also enjoy the observation decks that give you picturesque views over Fukushima. Hirosaki Castle: Due to the rich layout of this castle, guests can enjoy an abundance of cherry blossom trees, tunnels, moats, and various picnic areas. One could even rent a boat and watch the illuminations in the evening! Kakunodate: This castle town is absolutely famous for its weeping cherry trees that adorn the city’s well-preserved former samurai district. Kitakami: Head over to Tenshochi Park which is lined by over 10,000 cherry trees — perfect for your Instagram photos! Goryokaku Fort: This is a star-shaped miliatry citadel built in Hakodate towards the end of Edo Period and it has since been turned into a public park that has over thousands of sakura trees planted along its moats! Matsumae Park: It is famous for having a longer cherry blossom season (lasting almost an entire month) given the wide range of sakuratree varieties in its grounds. Nearby, you can also enjoy the Matsumae Castle which is the only castle on Hokkaido. Maruyama Park and Hokkaido Shrine: These two places are just beside one another and they attract a large number of visitors every year in the spring who enjoy holding hanami parties in its open space. You bet that it’s a great way to mingle with the locals! Previous NIIGATA PREFECTURE: A NEW JAPAN FOODIE DESTINATION!